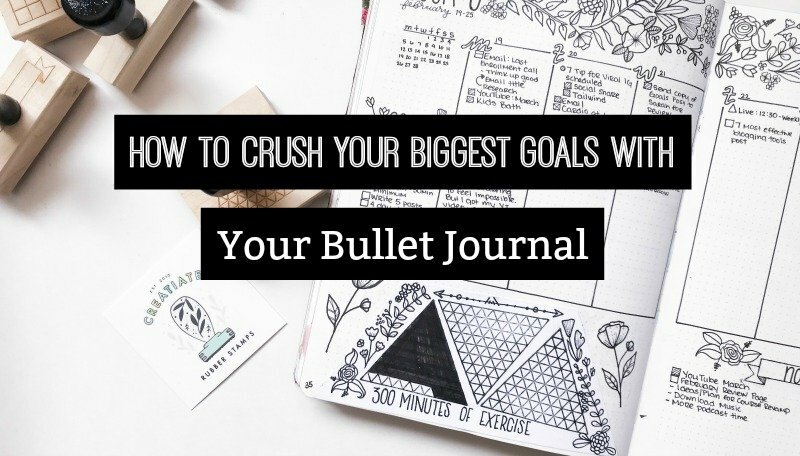 Learn how to crush your biggest goals with your bullet journal. This post will give you page ideas and tips to start achieving your goals, starting right now. *I received stamps from Creatiate in exchange for an honest review. **This post may contain affiliate links. Please see my Disclosure for more information. Everyone has big dreams and goals. We are pre-dispositioned to want to follow our passions and thrive. The biggest problem most people face is that they never write down their goals. If you don’t write your goals down, you have no way to track your progress, make changes, and create an action plan. I have been bullet journaling for over 2 years now, and I have never felt more on track with my goals. The bullet journal system allows me the flexibility to create, track, and review my goals in a way that works for me. Personally, I need to see things visually. Charts, graphs, and tables help me see the whole picture clearly. But, the wonderful thing about the bullet journal system is that you can make it fit your needs. So, if you’re a verbal learner, you don’t have to add drawings or graphs or tables. You’ve probably heard the SMART acronym before. But, if you haven’t I’ll provide a little refresher. 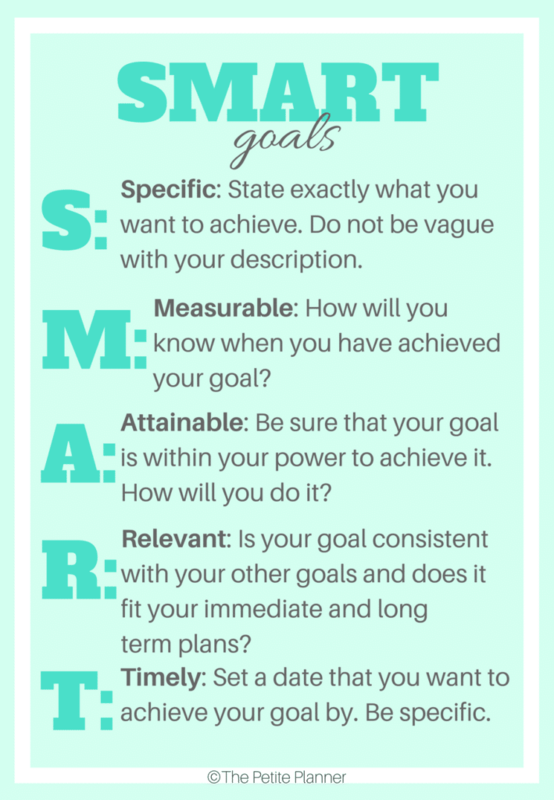 Your goals should all be specific, measurable, attainable, relevant, and timely. “I will lose weight.” This goal is not specific enough and does not provide a timeline. Sure, you could measure your success. If you lose one pound, 10 pounds, 20 pounds, etc. But, you would have no way to gauge how close you are to your end goal without being more specific. Instead, your goal might sound something like this, “I will lose 20lbs. before Christmas 2018.” This goal is specific, measurable, attainable (given it’s written in the early part of the year), relevant, and timely. It describes the exact amount of weight to lose and gives a specific date at which it is to be accomplished. “I will get a promotion”. Again, this goal is not specific about what kind of promotion. Do you want to be promoted to Senior Vice President, Cheif Executive Officer, or Senior Administrator? This goal also lacks a timeline and measurability. Instead, this goal could be revised to say, “I will be promoted to Senior Vice President by January 2019.” This goal is specific. It’s also measurable. Throughout the course of the year, you may receive smaller promotions, bonuses, pay increases, etc. that could help you determine if you are on the right track for the big promotion by January. Again, this goal is also timely, as it has a deadline. One more example of poor goal setting is choosing a goal that is unlikely to be achieved. For example, if you are working a minimum wage job and have very little in savings, it would be unlikely that you would be a millionaire within a year. Although saying “I will have 1 million dollars in my bank account by next January” is specific, measurable, and timely, it is likely unattainable given the situation above. So, now you have an idea of what not to do. Let’s start writing goals that we can and will achieve. 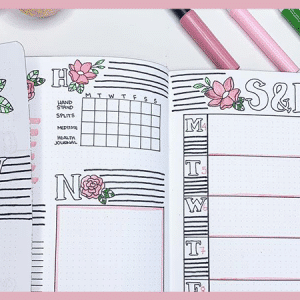 Before you start scribbling down all of your big life ambitions, check out these tips on how to crush your biggest goals with your bullet journal. Each of these tips is a simple and effective addition to your goal setting pages in your bullet journal. You probably have a list of annual or lifelong goals you want to achieve. These may include buying a house, paying off your student loans, losing 50lbs., etc. These are big goals. And when you look at them on a large scale, they can seem overwhelming. Instead, try breaking your goals down into smaller simpler steps. For example, if you want to lose 50lbs. in the next year, you can break that down into months and even weeks. So, each month you would add a monthly goals page and establish goals that contribute to your big goal of losing 50lbs. For a 50lb. weight loss in one year, you would have to lose approximately 1 pound per week. So you monthly goal may be to lose 4lbs. And your weekly goal would be to lose 1lbs. You can further break this goal down. Establish how many minutes you want to workout each week and make that your goal. Make a goal to stick to a 1500 calorie budget every day of the week. Both these smaller goals contribute to your overall, bigger goal. I like to add trackers to everything. There is something ultra satisfying about filling in a box after completing a task. In my weekly spread, I use this amazing 100 Day Tracker Stamp from Creatiate to track how many minutes I workout during the week. Each week I set a goal, usually 300 minutes of exercise, and then color in each small triangle for a minute I exercised. I love these stamps. They are the highest quality stamps I own. 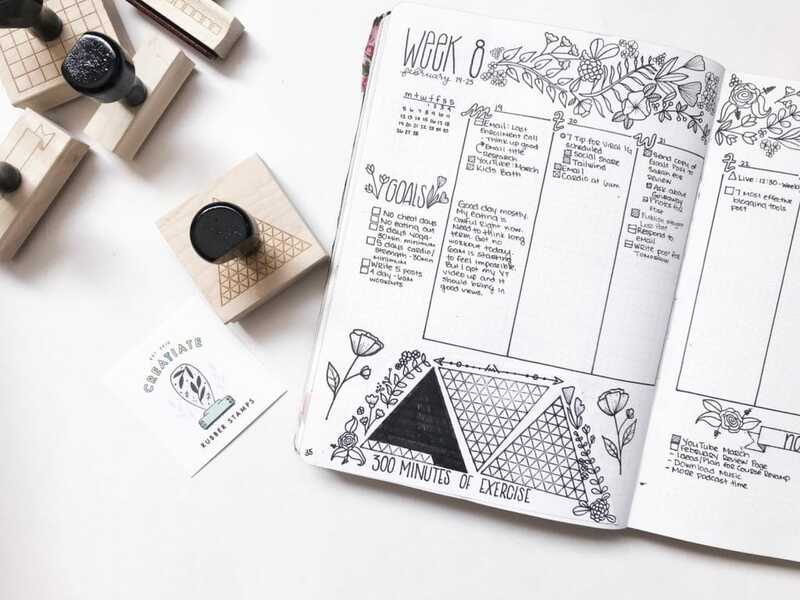 And Sarah offers a number of planner stamps that work well for goal tracking, like this monthly habit tracker stamp. 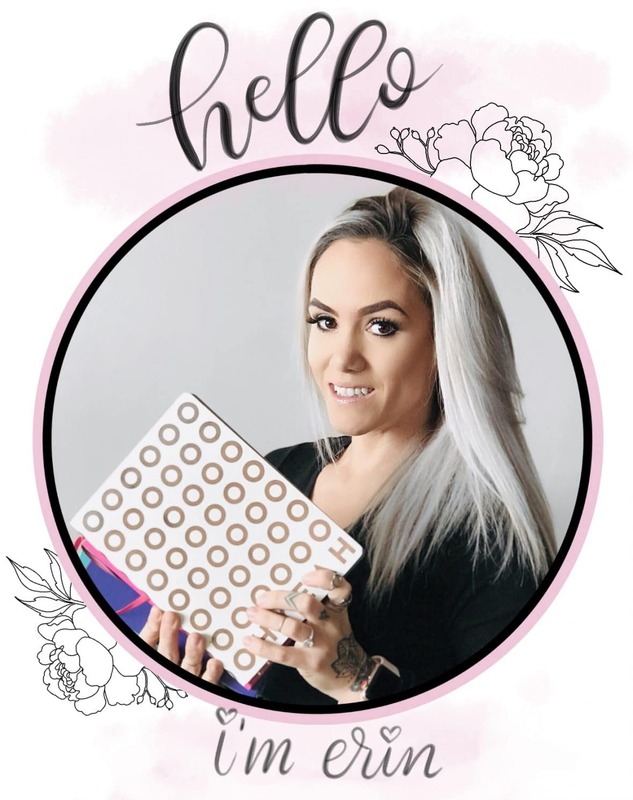 I highly recommend you check out her shop and her products. She is an angel to work with. As I mentioned earlier, filling in a tracker is very satisfying and can make motivate you to work towards your goals even when you are feeling lackluster. And using stamps will save you time and make you more likely to include these trackers regularly. I just recently put the Level 10 Life spread in my bullet journal. I wish I had done it sooner. Level 10 Life is all of your biggest ambitions and goals wrapped into one. You analyze the 10 focus areas of your life and rate them on a scale of 1-10. You can then take it a step further and set goals to improve each focus area. This is by far one of my favorite spreads in my journal. 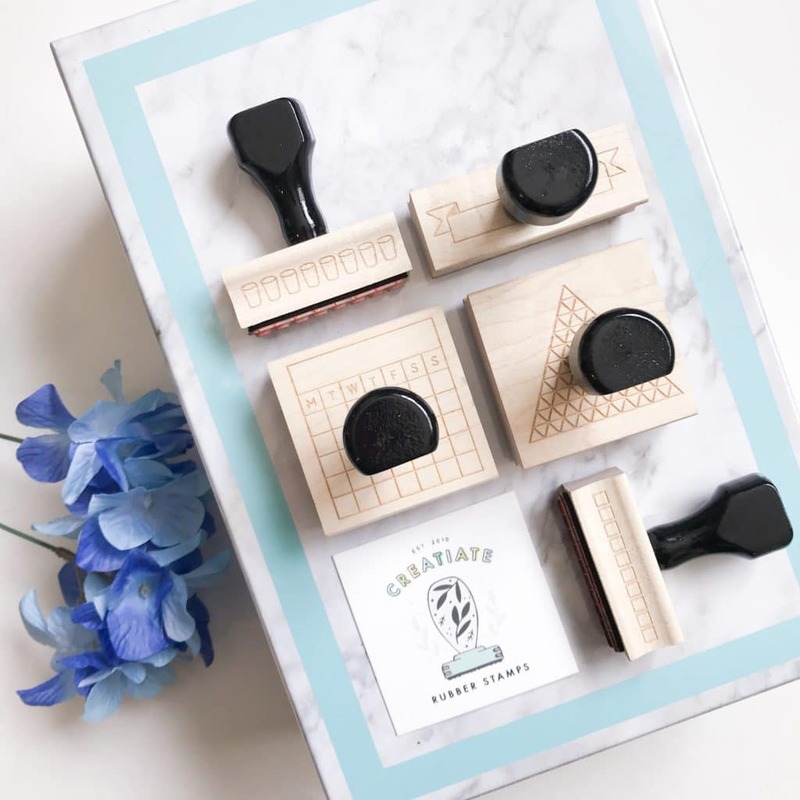 Starting today, Friday,February 23rd, you can enter to win this set of Stamps from Creatiate. 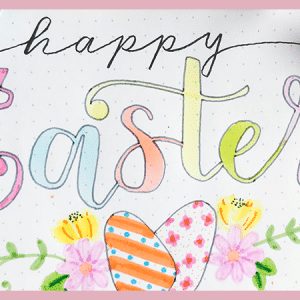 To enter, head to The Petite Planner on Instagram or Creatiate on Instagram. Go to the Giveaway post on either account and follow the entry rules. Have fun and good luck! What are you big goals for this year? 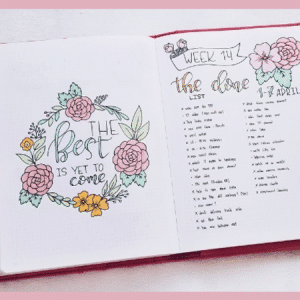 Do you already include goal pages in your bullet journal? Let me know in the comments below. And, share what inspired you most in this post.